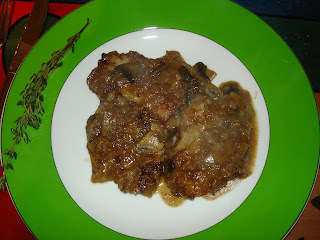 Veal marsala is one of my husband's and my favorite Italian dishes. As I have mentioned before on this site, I much prefer the taste of veal to chicken, most of the time. I am including our signature veal marsala as a Valentine's Day dinner recommendation because the combination of the mushrooms, marsala wine and Italian cuisine makes veal marsala a romantic dish. In addition, this is a specialty of our house that my husband and I lovingly prepare together as a team. The key to this dish is mushrooms and the marsala sauce. The mushrooms are so delectable when they soak up the sauce, so they must be prepared in a way that allows them to soak up the maximum sauce. They type of mushrooms that you use matters considerably less than simply making sure they absorb enough of the marsala wine sauce. Obviously, you also want to make sure to purchase high quality veal scallopini. 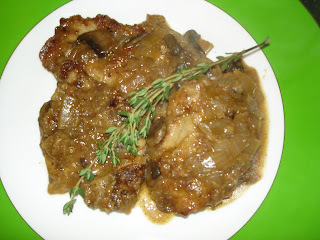 Brad has previously written about how to prepare a delicious chicken marsala, and the recipe and technique used to prepare veal marsala are very similar. We actually made this dish and took the photos a week or two ago. Brad prides himself on doing most of the execution of this recipe, although we worked out the specifics together. To prepare the veal scallopini, coat in flour and several teaspoons of paprika for seasoning. Further season with salt and pepper. The paprika adds a nice flavor to this dish that complements the marsala sauce well. Chop the onion and saute in canola oil or butter (we usually use butter for this dish) for a couple minutes to soften the onions. Add the garlic and the mushrooms, and saute until the mushrooms reduce in size slightly and until the mushroom juices fill the pan. Sear the veal in the pan, using canola oil, and cook the scallopini on both sides in a separate saute pan. Referring back to the mushroom pan, add the marsala wine and stir occasionally for about 5-7 minutes while the marsala wine reduces in half. Add the chicken stock, thyme and rosemark and continue reducing for approximately 5-7 minutes. You can also season further with salt and pepper to taste. At this point, add the veal scallopini to the pan. This recipe serves two to four people, depending on your appetite, but it makes for perfect leftovers as well. Like I said, my husband and I prepare this dish together, but he does a good part of the work on this one - thus we do consider it one his house specialties.